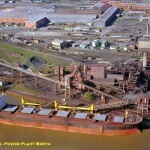 This port serves the steel plant (formerly government property Somisa) owned by private operators Siderar. The port consists of two sections. 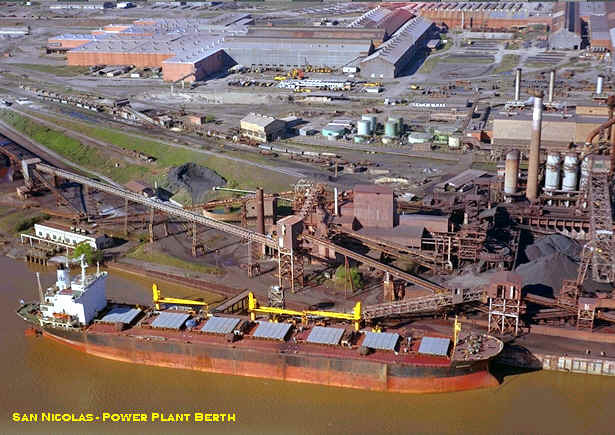 Berth “A” (southern quay) for discharge of iron ore and coal plus loading of coke breeze and Berth “B” (northern quay), the commercial berth for the loading of finished steel products. Both quays are of reinforced concrete and lie at an angle of about 230 ºeach other. “A” berth, 680 m length, 15 m width, fitted with 1 grab fitted crane of disrate 850 TPH and 1 crane disrate 1400 TPH and a grab fitted unloader with disrate 1600 TPH together with auxiliary equipment, plus bulldozers for operating in holds. “B” berth 320 m length, 30 m width, fitted with 2×15 ton SWL cranes and 1x30ton SWL. Additionally, 3×15 ton and 1×24 ton SWL forklifts for operating in holds, and shunting engines; railway wagons on quay.